U.S. Air Force Airmen will partner with the Royal Air Force and the French Air Force for a second trilateral exercise beginning April 12 through April 28, 2017, at Joint Base Langley-Eustis. 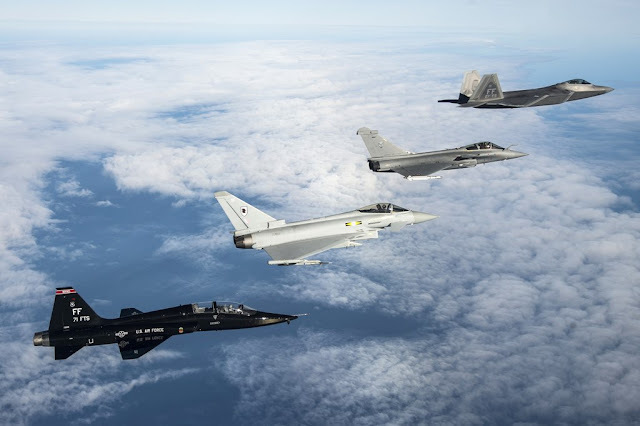 A U.S. Air Force T-38 Talon, Royal Air Force Typhoon, French Air Force Rafale and U.S. Air Force F-22 Raptor fly in formation as part of a Trilateral Exercise held at Langley AFB. Atlantic Trident 2017, hosted by the 1st Fighter Wing, focuses on air operations in a highly contested operational environment through a variety of complex, simulated adversary scenarios. The goal of the exercise is to enhance interoperability through combined coalition aerial campaigns. While various exercises are held with allied and partner nations throughout the world, this exercise is one of the first to focus on greater integration of U.S. Air Force fifth-generation capabilities. Joint Base Langley-Eustis hosted a similar exercise in December 2015, but the upcoming exercise will be uniquely valuable with the addition of the F-35 Lightning II to the training. Atlantic Trident 2017 will feature the U.S. Air Force F-22 Raptor and F-35 Lightning II; the RAF Eurofighter Typhoon; and the FAF Dassault Rafale. U.S. Air Force F-15E Strike Eagles and T-38 Talons will play the roles of adversary aircraft. U.S. Air Force E-3 Sentry and KC-10 Extender aircraft will also provide support during the exercise.